You asked, so we decided to answer. Here is your first look at our three newest patterns, now available for preorder! Let’s start with the ones pictured above. Jasmine is our newest blouse. I wanted to create a top that was great for Fall layering, body flattering, but easy and quick to sew. Jasmine is cut on the bias, so you don’t need any closures. Version 1 (the black and cream version above) has a cute little kerchief collar made in a contrasting fabric. The sleeves on this version have a little notch in the cuff… I could see adding a decorative button or two! Version 2 (in the starburst pattern above) has longer gathered sleeves, and the collar can be tied in a pretty bow. And then we have Clover, which I have a feeling will be the real hit of the season. Our first trouser pattern! First, I know many of you are intimidated about making your own pants. So I set out to make a pattern that is both chic and dead simple, so that you can concentrate on getting them just the way you want them. We’ll be posting plenty of fitting tips, and likely doing a sewalong at some point too! With just a few pattern pieces, you can make a pair of elegant cigarette pants that will carry you through Fall. Version 1 (the tweed ones above) are ankle length, with subtle pockets inset into the waistband seam. Version 2 (the aqua-green pair above) are mid-calf and will be great for warmer weather (or for those in the southern hemisphere)! These pants should be made in a fabric with a bit of lycra for stretch (1%-3% is good). Isn’t she so lovely? Peony is a boat-neck dress with short or 3/4 sleeves and a fully removable cummerbund-style belt. The belt can be made in a contrast fabric (version 1) or in your main fabric (version 2). This dress lends itself to countless variations, and especially to embellishments. Caitlin is going to share a few of those in the coming weeks. I’m planning to do one this Fall in a light pumpkin silk, and I cannot wait. So hop on over to the shop and place your order! The patterns are just getting bound, stuffed, and glued as we speak, and should start shipping from the warehouse in 1-2 weeks, so it’s not a long wait at all! Fall patterns are shipping and Clover Sewalong in October! I just swooned, I don’t swoon but when that Peony dress appeared on my screen I swooned! I love that, the simplicity, the flow I can’t wait to see the variations that you have lined up! Beautiful! I’m soooo excited to make all of these! All three are just fantastic! I’m looking forward to seeing more variations. I definitely plan to order them. Just placed my order for Peony and Jasmine. I can’t wait to make them! Thank you for putting pockets in Peony–not enough dress patterns include pockets and they are a necessity for me! I can’t wait to make them. Absolutely stunning as usual. I can’t wait for these patterns to be available in the UK! Your patterns are by far the best ones out there, I love them. Wow Sarai, you have completely outdone yourself with these. Beautiful and so chic. Have just pre-ordered all three. wow, these are gorgeous! i love them all, but especially those pants – super sleek & flattering. win! Wow they all look great but I’m especially tempted about trying the trousers! Ooooooh! I’m so excited! The blouse is lovely, from the cute tie to the little notch detail, the dress is classic and gorgeous and the trousers are finally enough to make me want to try making trousers. I’m so glad to hear you’re planning a trousers sewalong too – wn I first heard there would be a trousers pattern I was thinking a sewalong would be great. omg. I’m so excited! Peony has my name all over it. Woot! Ordered- and now I get to start out Self-Stitched Sept with a Peony, fabulous!! Wow! All of the patterns look really amazing. I really like the fit of the Clover trousers. Can’t wait to get my hands on these patterns…Well done! LOVE the new dress!!!! I love the teal-green fabric. Could you please tell me where you got it from. I would love to make your dress out of that color. I know that the teal pattern is the one you made (I think) I love that too BTW. Thank you so much…. It really is a beautiful fabric. We bought it locally at Mill End here in Portland. It’s a very lightweight wool, smooth and not at all itchy. Such a bummer. I would love to have ordered some, but I did just order some of your awesome fabric that you designed. Love them all! Will the Peony variations include any neckline variations? The shape of the dress would be very flattering on me, but boatnecks tend to not be the best neckline for my large bust. We shall take that into consideration! Perhaps when we do a sewalong at some point. It would be a very easy modification if you just wanted to lower it to a scoop neck or something. That little blouse is devine. I love how the biascut fabric flows around the model. Great look. I like everything. Especially Jasmine. Is there availability to the UK if we pre-order? Love the new patterns! Makes me wish I looked good in cigarette pants. So excited for Clover – you have no idea. Absolutely gorgeous – all of them! What type of fabric is the white peony made out of? It looks absolutely classic and elegant… I am already envisioning sewing all three of these up! The white one is a lovely wool crepe. SWOON. Glad to see everyone else is as excited as I am. All three are a fall NECESSITY! I love them!! I already know my first request for a tutorial, which is how to narrow the shoulders and upper back on these great wide necked patterns? wow. just wow. i have pants super similar to your clover trousers which i purchased for loads of cash from j.crew. they are perfect and the prospect of being able to make my own in any fabrics i choose …. ! and everything else is super lovely too. i am an absolute novice when it comes to sewing but you have inspired me to work hard at it because the prospect of making these items for my closet is just beyond awesome. Oh, my. These are absolutely lovely, Sarai! I am already daydreaming about the versions of Jasmine and Peony I’m going to make. My shipment can’t come soon enough! I couldn’t be more in love with Jasmine! Such a wonderful addition to an already stunning collection. Way to go ladies! I just ordered all 3! I’m excited about my first challenge in sewing pants. :) The ensembles above are just gorgeous – I just LOVE the look of that black and ivory top with chambray bottom in that first image (is that chambray? what type of fabric was used there?)!!! I cannot wait! I already know that these 3 pieces will be a part of my Fall Palette Challenge! What pretty clothes! I love the detailing in the top. I had sworn off ever making pants again, but I will give these cigarette pants a try. I am excited to see them. You are so talented! Thank you for designing such cute clothes!!! Oh my! These patterns are all so lovely. I especially like…oh wait, I especially like all of them! I’ve really got my eye on Clover – I’ve been looking for a pants pattern and haven’t been able to find anything just right from the Big Four. Well I know we have lots of lovely folks sewing in that half of the world too! I love all three! They are going on my Christmas wish list right now. I especially love that you’ve got a pants pattern. I have no hand sewn pants and that’s really what I need for the fall and winter. I like these VERY much. Of the three, the Peony dress with 3/4 sleeves is my fave. I am interested to see how I could translate it into various styles. Well done-these are more sophisticated styles-really nice. The Sencha top is next on my sewing list, but I’m going to put Jasmine right after. I’ll have to figure out how to incorporate it into my Fall Palette Challenge. Lovely job. It’s exciting to see your work blossom. Seriously, I have been looking for a cigarette pants pattern!! So excited! I am going to get this pattern and wait for the sew-a-long! My first pair of trousers didn’t work out very well, so I think a sew-a-long would be perfect for me! OMG, I am swooning over these! The neckline on that blouse is spot on! I was just thinking of an ivory silk too! And I love love love the dress in pink. I happen to think that a boatneck is flattering on a large bust, but it would be easy to lower it too. I would also like to commend your choice of model. All your models are fabulous, but it’s fun to see someone a little older who could be a mom like me! I know this has been a topic of discussion in the past, but I really do think it’s much easier for customers to shop if they have an idea of what the clothes may look like on their own bodies. Providing a variety of models makes this easier. I had just crossed off the idea of wearing a pink dress myself to baby girl’s birthday, but now I’m re-thinking. I’m off to pre-order the blouse and dress. (those pants are so chic I also wish I looked good in cigarette pants, but not usually. I’ll watch the sew alongs with interest to see if I change my mind.) thanks so much for sharing these early! I am just so excited I could pop! I want all of these patterns now, they are all so gorgeous. I’m currently working on Violet, so that will keep me ticking over until I can get my hands on these lovelies. And with all the gorgeous Autumn fabrics to choose from….bliss! Ahh all of them are so lovely!! I really enjoyed designing it! What fabric type did you use for the blouse in the photo, if you don’t mind me asking? Was it the quilting weight or a lighter fabric from their site? Oh, time to drool!! Just got back from a tough choir rehearsal in the hopes this post was up and there it is! I shall sleep well tonight dreaming of what I can make! The jasmine blouse looks so fresh and easy and no buttonholes!! :-) I love that patterned fabric you’ve used too. Methinks I’ll be ordering the dress and blouse tomorrow! Will reserve judgement on the trousers for now – I hate seeing myself in them, but you never know, a sewalong may help me change my mind! Oh, they are all lovely, but that dress! Perfection. I love the simple lines of these patterns, they are so inspiring! I love the peony, thinking about using a nice wool to recreate one of my favorite vintage dresses. Would it do well in a slightly heavier weight fabric? And I am intrigued by the challenge of pants, the sew along will be a must! I think it would look great in fabrics heavier than these! A little body is good for the dress, as long as the fabric isn’t super bulky. Congratulations – these all look divine!! Gorgeous, as expected. Love the cigarette pant and have a lovely navy twill (with lots of stretch) and a brown tweed (no stretch!) which I think would serve my wardrobe beautifully for fall. Since I’m trying to sew from my stash, do you think I could make these using a non-stretch woven? And is there any harm in sewing it up with too much stretch? Many thanks!! I actually originally designed the pants for non-stretch fabrics, but I found them to be more comfortable with a little lycra, so I changed it. You can certainly make them and get a good fit with non-stretch, but my main concern was with movement and sitting comfort, particularly in the knees since they have a slim leg. I’d advise a muslin, which is very very quick with this pattern. Then try moving around and sitting before you decide. If it has more stretch, that could definitely work! I’d try draping the fabric and seeing how it looks… depending on the weight and the amount of stretch, you could get into leggings territory. Love love love! I’m so excited for these, especially the Jasmine top. I am so excited for fall sewing! Love the Peony option with the longer sleeves especially. I also noticed that all of these patterns are for beginners. I was wondering if there would be any intermediate patterns on the fall horizon or if the sew alongs would detail optional and more advanced techniques to work into these great patterns. Thanks! We’re doing lots of embellishment and detail ideas, many of which fall more in the intermediate territory. I just found your patterns and already have a long list of the ones I want to buy, the 3 newest ones are at the top of my list now! LOL I will be making these for myself and my teenage daughters. You are so talented! What fantastic new patterns. They’re all elegant and modern. I have just swooned with joy! What gorgeous patterns!!! Jasmine is definitely making an appearance in my fall/winter sewing. Sensational! Love the new patterns! The “you don’t need any closures” part of Jasmine is very exciting. :D Peony looks so elegant – I’ll definitely be making it as part of the Fall Palette challenge! goodness, I just love all three new designs! And I especially enjoy seeing them sewn from the fabric you selected during your shopping trip. Oh! OH! I love them so much! I’m going to get the pants. They will be awesome for layering the big flowing tops that are in right now. omg. all. amazing. I’m getting them all! The pants are just what I need! 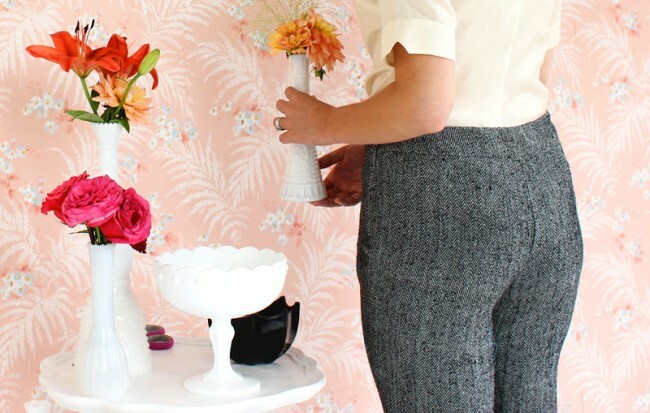 What type of fabric is the beautiful pimk peony in? Can’t wait to sew these up… so gorgeous. I like Peony, but I am still unsure about it. But the one that caught my eyes was Jasmine: The perfect blouse en version 1! Probably not for winter season: the flattering on every one neckline will be too low to wear under jacket… I will have to test this. But I have a question about Jasmine: the contrasting collar seemes to be scalopped, this detail doesn’t appears on the linedrawing… Is this collar slitly scalloped or is it just an effect due to the cut on the bias??? It isn’t scalloped, no. It might be waving slightly in the photo… it’s cut on the bias in a very light fabric. Absolutely fabulous – I love them all. The pants won’t suit me :( – too bad.. Styling is gorgeous too, great pics, lovely model (who doesn’t look like a mom to me, by the way) and that fabric you designed is sooo pretty. I’m a recent follower of your blog and I discovered you Fall Collection : it’s really beautiful ! I’m also in love with the Trousers but I’m wondering if it’s a high or low waist pant ? High waist are definitely not for me…. Can’t wait to see more of every ones’ Fall Palette with those new pattern !!! It’s a medium waist pant. The waistband sits just below the natural waist, so not super high by any means. Wowsers! These are all really lovely – especially the dress and the shirt for me (love the cigarette pants but unfortunately not so good with my thighs and ankles). Like the other poster I’d be very interested to see some neckline variations on the dress if you were to do a sew-along. Jasmine is exactly what I’ve been looking for! I had a very similar blouse from Uniqlo which was incredibly flattering, and I’ve been trying to re-create it for ever. I love this pattern. Oh my gosh, I adore all of these, and can’t wait to get my hands on them! Thanks for another great set, I’m sure they’re going to do amazingly well. Oh.. I’d love to add Jasmine and Peony to my fall palette challenge projects.. I hope it wouldn’t take to long till they are available at european online retailers..
Oh holy hell. I love these patterns! I love love love that Jasmine has no closures! And the pants, the pants are divine. I love peony as well, but I share another commentator’s concerns that the style might be less then flattering for my less then subtle bosom. But I’ve been pouring over slim fitting ankle length pant patterns with pockets on Burda style for weeks, unsure which one might really be the one for me, and now, Colette, a company one can really trust, has come out with trousers. Sarai, have you been reading my dream journal? And by that I mean my tipsy late night inner monologue? Wow Leah, what a flattering comment! These are all so marvelously classy. I love the pants, but am not sure they’d work on me. I have a good fairly sz 6 figure; however, after 7 kids I’ve got a tummy.. How would these work with someone who’s not Audrey Hepburn? You body type sounds a lot like mine (except I have the tummy sans kids), and I love them on me. But I do like things that emphasize my legs. Very cute top! I really like it. Natasha, it just needs to be big enough to fit your head through. You could raise it quite a bit, especially since the neckline is a bit wide. Those pants, oh those pants! Swoon. Amazing amazing amazing! I am very excited, especially about the dress! These new patterns are just so beautiful … after making clothes for my daughter for the past few years I have now bit the bullet and am sewing for myself … eeeek! It’s addicitive … with your beautiful Peony dress … would it be possible to make the dress without sleeves as well? WOuld I just have to fashion some armhole facings? Congratulations – so glad I found you … will be ordering patterns soon! IT should be easy to get on and off, since it’s not tight and is cut on the bias, meaning that it can stretch. I absolutely love the new patterns, especially Peony! The pink version you made up is so sweet and elegant at the same time, my absolute favorite:) Can I ask what kind of fabric you used? The pink fabric is a plain woven silk… slightly crisp, but not as stiff as dupioni. I want…no, I need a tutorial on the cigarette pants. I would like to make a pair in black for Christmas. That’s my goal. Hope you have the tutorial by then. I love the peony pattern! Would it work in a cotton lawn? I’m thinking no, not crisp enough. But I have a cotton lawn it would be so cute in (Liberty of London, Pauly Parrot, pink) , so I’m really hoping it would work. I think it could work in lawn, though if it seems a little light, you may want to line it or underline it. love the dress pattern!! what level of sewing do you think this would require? i would say i’m an intermediate or sometimes overly confident beginner :) thanks!!! these are all labeled beginner! Are the patterns getting close to shipping? The suspense is killing me!!! The patterns are now shipping! Silly question perhaps, but I was just looking at the Peony yardage to make sure i bought enough dupioni (wedding shop has it on sale at €8 a metre woohoo so I bought loads of different non-wedding colours!) and I noticed that the hem width is kind of narrow… in the larger sizes it is much narrower than the bust… it looks like a slightly A-line skirt to me – am I wrong? Yes, the pattern is an aline. Hmm, I will double check on the hem width. Thanks, I was hoping it was:)… like A-lines…. shipping – yes! Do the pants have a place marked on the pattern to help with shortening? I always have to shorten the crotch length and lower the center front a bit because I’m petite and my waist is higher in back than in front. Also, since your sizes include larger sizes, will they look all right on curvy figures? PS: Just finished making the Oolong dress for an upcoming wedding. I’m glad I made a muslin first, because I did have to shorten it about an inch and a half above the waist. The finished dress looks and fits wonderfully, and the lining underneath really makes it flow beautifully and look great. It has marks for adjusting leg length, though not crotch length. Good suggestion. But we’ll be covering this in the upcoming sewalong! Peony! I’m DYING for this dress. I’m in Italy for the next three months, and this dress would be perfect for my travel wardrobe. Alas, I have no sewing machine here and will have to wait until I get back to the states. I know. This is the epitome of a First World Problem. Can’t wait to see the sewalong to see everyone’s variations on this. Oh my goodness – I am in love! I cannot wait to try that dress and those pants! Amazing! I received my patterns today and am so buzzed! They came really quickly – to Europe – thank you! Great clear explanations as usual – I am already working on the blouse – I haven’t decided on which sleeves and collar yet, I have 3 yards of a silk from Egypt which is only 40″ wide so I am going to see which sleeves and collar fit in and go from there…. then the dress with long sleeves in black and white check dupioni with a red cummerband. And I have more planned for each…. lovely. I am also waiting breathlessly for the book – yay! It would be very easy to match the plaid on the CF and CB seams! They’re symmetrical, so it should be quite simple. If you want to match the plaid on the sleeves, that’s always a bit trickier of course… for any sleeve! Having said that, I’d probably start with something not too tricky to fit and without too many pieces. 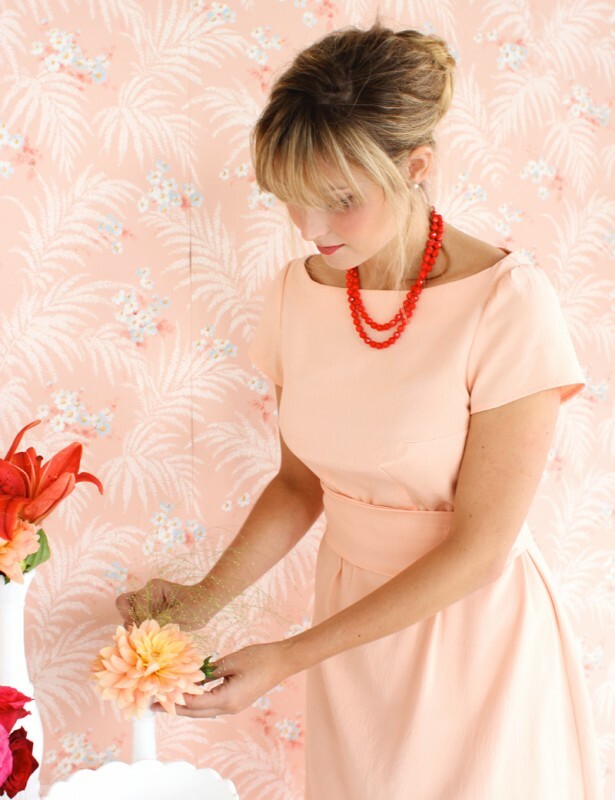 The Peony dress above could be a good one to start with!